The first page of this breviary has the beginning of a cycle of prayers around the theme of the Holy Spirit's actions on earth. 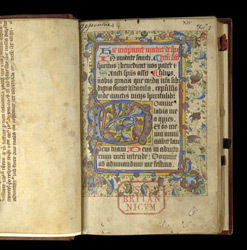 The prayers on this page were for matins or very early morning (about 2:30 am). Framed with a rich border of leaves and patterns in gold, the page is not as elaborately decorated as some other contemporary examples. Often in other manuscripts it begins with a picture of the descent of the Holy Spirit.